I am very pleased to have Lev Grossman with us today as his first foray into Fantasy The Magicians was just released August 11th. 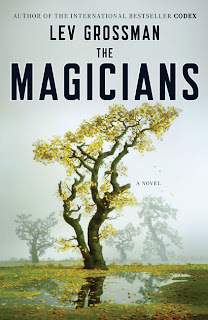 I thoroughly enjoyed The Magicians and you can check out my full review here. Grossman is a graduate of Harvard and attended Yale for Comparative Literature, which means he is a very learned man in the way of words. MH: Hello Mr. Grossman, welcome to Mad Hatter’s Bookshelf. Thank you for taking time to answer our questions. Firstly, can you tell us a little about yourself? LG: Hi! Thanks for having me here. Well, I’m 40, I live in Brooklyn, I work at Time magazine as their book critic. And I wrote a novel called The Magicians. 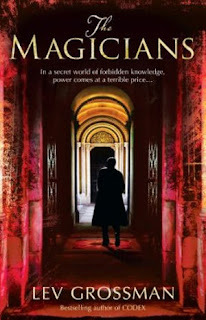 MH: For those who haven’t read The Magicians, what would you say perspective readers to whet their appetite? LG: The Magicians is a grown-up take on young adult fantasies like The Chronicles of Narnia and Harry Potter. If you love those books, but ever wondered it would be like if they were a little less cozy, and a little realer and more grown up, that’s The Magicians. Or as near as I could get to that. MH: What did you want to accomplish with The Magicians? What themes were you exploring and do you think you succeeded? The idea of consequences seems to be central. LG: Consequences, yes. I didn’t start writing The Magicians with any ambitions in mind other than this vague notion that I wanted to tell a story, something in the vein of Narnia or Harry Potter, but written for grownups. If such a thing is possible. (I was fresh off reading JONATHAN STRANGE & MR. NORRELL, by Susanna Clarke, and therefore believed that anything was possible.) But I think what I also wanted to do was understand what fantasy means to me, and why I have always, deep down, wanted to actually go to Narnia, and/or Hogwarts. And I wanted to think seriously about what would happen if I got what I wanted. MH: What fantasy books have left you in awe? Which writers have influenced your work the most? MH: Have you always wanted to be an author? LG: Up until college, all I wanted to do was get into college. Once I got there, all I wanted to do was be a writer. MH: Have you ever written a full-length work that you haven’t published? LG: No. Though my first novel, Warp, much as I love it, is borderline juvenilia and arguably shouldn’t have been published at all. Fortunately nobody noticed it anyway. LG: The technique I’ve hit on that works best for me is to do a very detailed outline, then start writing, then watch as that outline crashes and burns halfway through. As the saying goes, a plan rarely survives contact with the enemy, the enemy in this case being the empty page. After that happens, something much more interesting tends to rise from the ashes. MH: The US and UK covers are drastically different. Are you happy with the covers you’ve been given and how important do you think they are to a books’ success? It definitely seems as though your US publisher wanted to stay away from the typical fantasy look. LG: It’s funny you should say that. None of the covers look anything like what I imagined for the book. (True fact: most authors don’t get to choose their book covers, unless they’re Stephen King.) But I love the US cover immoderately. I think the publisher’s thinking there was not to go for traditional fantasy, but to try to come up with something vaguely fantastical that could appeal to both fantasy and mainstream readers. I’m obsessed with that image, which is called ‘Autumn Tree,’ and was created by an extraordinary French artist named Didier Massard, who actually built that landscape in his studio as a model, then photographed it, then messed around with the photograph. I tried to buy the original, but it turns out it costs $20,000.I had hoped that the UK publisher would go for a more straightforward fantasy cover, but they wanted something that looked more like my last novel, Codex, which was more of a thriller, because Codex did well for them. But I worry about whether it will reach fantasy fans. MH: In another interview you mention you will be continuing The Magicians as a series. Can you tell us a little about what is in store and when the next volume might be released? LG: There will be a sequel. It won’t pick up directly after the end of The Magicians, but some years later. That’s all I can say for now, because it’s all I know. I hope to finish a manuscript sometime next spring. MH: In the next volume will you reveal more about the nexus that connects the different worlds and maybe what Penny has been up to? LG: I’ll be very surprised if we’ve seen the last of Penny. Though maybe we've seen the last of him in his present form. MH: Your twin brother Austin is the author of Soon I Will Be Invincible. Have you ever felt competitive with your brother? And which of you is the better looking twin? LG: Yes, and yes. Austin and I have a very complicated and (to me, anyway) productive relationship as writers. Invincible, which I read in manuscript, was a major influence on The Magicians. In fact it caused me to scrap another, more conventional book that I’d been working on for two years. I would like to think the influence runs both ways. But I can only vouch for my end. MH: If you could be any character from The Magicians who would it be and why? LG: It’s difficult. I tried so hard to give them all equal measures of happiness and unhappiness. Checks and balances. Anaïs is probably the happiest of all of them, but her personality has certain … deficits. Janet is the one I identify with most, personally. But all things considered I’d probably be Eliot. He’s a very gifted spellcaster. And he has nice shirts. MH: What are 2 things about you most people don’t know? Do you have a pet monkey you keep sequestered in the backyard? MH: Is there anything else you’d like to say? LG: I feel like I’ve said too much already.